Purpose: To acquire the skill of getting one specific communication across to a listener and understood. Have you ever seen someone who just keeps talking, without ever knowing whether or not his communications are being received? Making oneself understood is an important part of the communication formula. Training Stress: The communication goes from the book to the student and, as his own, to the coach. It must not go from book to coach. It must sound natural not artificial. Diction (the manner of pronouncing words) and elocution (the mannerisms and art of public speaking) have no part in it. Loudness may have. There is no special significance to using the book Alice in Wonderland. In this drill you say things from a book instead of making them up. Any idea is yours that you make yours. When you take an idea out of a book, it becomes your idea, and then as your idea you relay it to another person. The drill is coached this way. The communication is not from the book to the coach. It is from the book to the student, and then the student, making it his own idea, expresses that idea to the coach in such a way that it arrives at the coach. We know at once a person can’t communicate when he cannot take this first basic step of taking an idea, owning it and then communicating it to someone else. 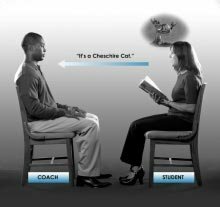 In coaching we want the student to find a phrase in Alice in Wonderland and then, taking that as his own idea, communicate it directly to the coach. He can say the same phrase over and over, if he wishes, in any way he wishes to say it, until the coach tells him that he thinks the communication has arrived. It is the intention that communicates, not the words. When the intention to communicate to a person goes across, the communication will arrive. The intention must communicate, and it must be communicated in one unit of time. It isn’t repeated from the last time it was repeated. It is new, fresh, communicated in present time. Once a communication is relayed across successfully, then he can find another communication and communicate that. Patter: The coach says “Start,” says “Good” without a new start if the communication is received or says “Flunk” if the communication is not received. “Start” is not used again. “That’s it” is used to terminate for a discussion or to end the activity. If the drill session is terminated for a discussion, coach must say “Start” again before it resumes. This drill is passed only when the student can put across a communication naturally, without strain or artificiality or elocutionary bobs and gestures, and when the student can do it easily and relaxedly.